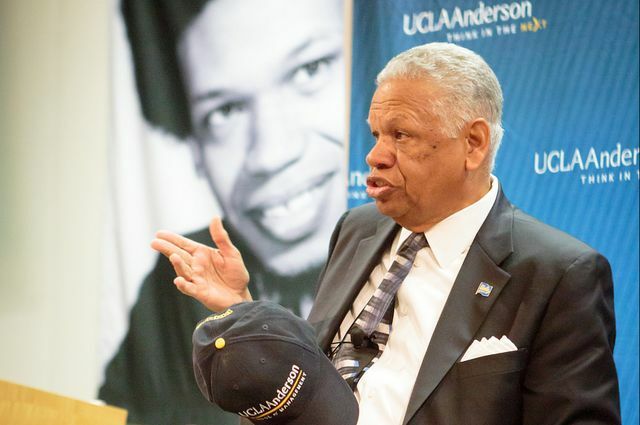 Al Osborne has been part of UCLA Anderson for more than 40 years. In July 1978, Al Osborne, interim dean of the UCLA Anderson School of Management, earned tenure at UCLA. 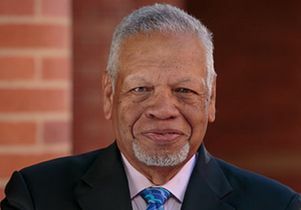 He started teaching here even earlier, when he was hired in 1972 as an assistant professor of management before completing his doctorate in business economics at Stanford University. And apart from a brief sojourn in Washington, D.C., where he served as a Brookings Institution Economic Policy Fellow at the Securities and Exchange Commission, Osborne has been leading, teaching and inspiring the Anderson School of Management community ever since. Formerly Anderson’s senior associate dean for external affairs, Osborne has played a central role in the school’s academic life for many years, including serving as associate dean and director of the MBA programs. He led the establishment of Anderson’s centers for finance, real estate, international business and entrepreneurship, and created programs that apply entrepreneurial business models to the nonprofit world. More recently, in collaboration with other academic units at UCLA, he helped design and launch the minor in entrepreneurship and the Anderson Venture Accelerator, which supports early-stage ventures affiliated with UCLA. On his first full day in his new role, Osborne sat down in his memorabilia-filled office for a wide-ranging conversation. What are your top priorities as interim dean? My priority is to advance Anderson’s core mission and to strengthen our position for the future. I want all members of our community — whether students, faculty, staff, alumni or supporters — to feel positive, valued and inspired to be part of Anderson’s broader commitment to knowledge creation, enlightened education and purposeful action. I also have a few specific goals. First, it’s especially important that we empower those whose futures we aim to influence, namely students. I’m working on some leadership development ideas that focus on helping students find their voice so that they can express themselves confidently and persuasively. In this turbulent world, we need leaders who know their minds, speak their minds and effectively engage others in positive impact. This relates to the very important theme of values-based leadership, guided by moral principles and an active practice of achieving desired outcomes in constructive and collaborative ways. UCLA is blessed to carry on the leadership teachings of coach John Wooden. His values-based leadership principles should be at the core of our leadership curriculum. A second goal: I believe in building an inclusive and connected community of college scholars and students. Silos of academic excellence are less important to our mission than the richness of what’s to be discovered by working at the boundaries of knowledge, through collaboration. I’m interested in more interdisciplinary work, across the university in addition to within our management school. I believe that the collision of ideas from varied perspectives creates the energy that promotes new discovery ― whether it’s engineering and biology working with marketing and entrepreneurship, or law and medicine working with patents and new chemical compounds. The insights and efficiencies gained through collaboration will be the hallmark of tomorrow’s leading universities. Here at UCLA, with such a powerful community of thought leadership across multiple fields, we have not only the potential but the commitment to align our enviable intellectual resources against solving some of the world’s most important and pressing issues. A third goal is to embrace the value of cognitive diversity throughout our community. The acceptance of different points of view as expressed typically by different ethnicities, genders and cultures is the secret sauce of the American experience. The more experience we have with others whose life experiences differ from our own, the richer and broader our own perspectives become. I want to encourage people to get out into the traffic of ideas and collide with somebody with a different point of view. Physicists tell me there’s no work unless there’s friction and there’s no energy or power without collisions. So, let’s collide in a more inclusive and respectful way, with more diverse individuals across the campus. What is key for members of the Anderson community to know about this new time in the school’s history? Management education is at an important crossroads. The traditional sage-on-stage model is outmoded and challenged. Society is demanding a different, more cost-effective approach to management education. It’s not just about developing web-based or hybrid modes of learning, it’s about a fundamental restructuring of how people learn. Management education has to be multimodal, and it’s increasingly active. By active, I mean that students want to be involved earlier in applying knowledge to solutions. They want to make an impact while they’re learning. Management’s critical role is to understand what society’s needs are, and to then organize the production and distribution that’s necessary to satisfy consumption. As a school of management, we must certainly do the same. How would you describe your approach to being interim dean? I believe in servant leadership. I want to hear from those I serve — faculty, students, alumni, staff, everyone who has a stake in this community. I want to understand and be open to their aspirations and concerns. My role is to support and encourage actualization of their individual goals — as long as they are consistent with the goals and objectives of our school’s mission. That’s why I’m here as dean, to empower the Anderson community in the context of our academic environment, encouraging teaching and learning and service to Los Angeles and the greater world around us. What qualities attracted you to Anderson, and how has this institution allowed you to make your mark on the world? I came to UCLA as an assistant professor of economics and my goal was to get tenure, which I thankfully did really quickly. From the beginning, I felt this was a broad, multi-ethnic community; it’s what attracted me and what brought me back after I went to Washington to work as a fellow at the SEC. I was at the Brookings Institution in association with then-chairman Harold Williams, who was also the dean who hired me at Anderson. Coming back to UCLA from Washington was the best decision of my life. It gave me the opportunity to work with then-Dean Clay La Force. To this day, I consider Clay to be my most important mentor. His support for entrepreneurs and for me building what became the Price Center was very important to me, and the latter, at least, was very important to the school. Following the launch of the entrepreneurship program, Clay appointed me associate dean for program development, leading us to establish centers for global management, for real estate and finance. But my driving interest continued to be in entrepreneurship. It was really an outgrowth of my economic interests. Societies that don’t innovate are destined to die, and my view is that our management school can benefit from understanding things entrepreneurial. For MBA students, entrepreneurship can be a means for them to discover who they are and what they can do. There’s nothing like trying to create value for an audience you might call customers — growing an enterprise, doing what’s necessary to satisfy customers by assembling and managing the necessary resources, and, over time, perhaps exiting, and creating value. It’s a daunting task. Entrepreneurs are doing America’s hardest job, but they’re needed to secure our future in a turbulent world. All sectors — private, public and nonprofit — benefit from entrepreneurial thinking. For me, the essence is, how do we make an organization successful and responsive to the needs of a focused audience? Whether you need money or you want to achieve a mission, it’s really the same thing. That’s why I went on to develop a series of management development programs tailored for entrepreneurs in different sectors, including our 20-year Head Start partnership with Johnson &Johnson. So, I think it’s fair to say that, thus far, I’ve made my greatest contribution to Anderson through the Price Center. And, of course, much of the credit for the center’s ongoing accomplishments — including our new Anderson Venture Accelerator — belongs to the excellent team led by Elaine Hagan. How do you apply that whole sensibility of entrepreneurship to Anderson now, given that it’s an established institution? I believe the future of Anderson lies in its ability to pivot and be flexible in the pursuit of new and different business models. Business schools in general are at a point where we need to think entrepreneurially, to reinvent ourselves … and an administrative approach is not enough to do it. Faculty, by our nature, are entrepreneurially curious and skeptical. We should apply that inventive nature for the good of education. And, at the same time, we should encourage our faculty to commercialize their ideas, which is another part of our role in society — to create. The protection of free and open inquiry is something I value greatly. Without faculty who traffic in new ideas, there will be no growth or learning for the future of civilization. Fundamental knowledge is critical for tomorrow, and for our students and our stakeholders to flourish. Faculty and students working together can create enormous value. And especially when we work together across intellectual silos. I have a commitment to these tenets. And your personal feelings about teaching? Because you’ve always taught at Anderson. I love the energy of the classroom. The translation of ideas that are useful to students as they learn is a very satisfying experience. I’m committed to high-quality teaching and an effort to be responsive to the changing needs of students, as they develop their own perspectives on various subject matters. What’s been the greatest honor that you’ve received in your career to date? I really resonate with the Head Start awards. They made a real difference in my life. It’s been incredible to be able to work with Head Start and see the impact that we’ve been able to make. We are helping empower leaders on the front lines trying to give a head start to families in economic risk. As a result, kids who could have been forgotten will be building tomorrow. What is your favorite advice to share with students — or with anyone, for that matter? Don’t be afraid to take a chance. Don’t be afraid of the future. Welcome the opportunity to test limits. And don’t sweat the small stuff. Is there a little-known fact about you that we might share? Well, I’m a violinist. I’ve played since third grade and always tried to stay two lessons ahead of my brother as a kid. But, ultimately, I decided I didn’t want to put in the eight hours a day necessary to be concert-level. So now I focus on my very modest golf game! 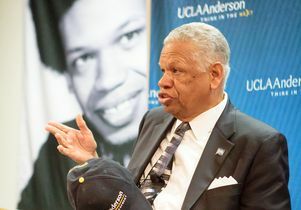 Alfred Osborne Jr., interim dean of the UCLA Anderson School of Management.